Legacy data. Every data manager’s worst nightmare. Today organisations have petabytes of files going back decades that they need to migrate. And with the exponentially increasing levels of data and the need to classify and control it, how do we face up to legacy data that can include literally billions of historical data files? And how can we determine which of these are critical to your business operations, and understand where your data is hiding, so you can demonstrate compliance when the pressure is on? GDPR is just part of a new wave of legislation dictating how we protect the data we hold. 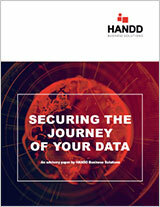 Data management and Independent specialists in Global Data Security, HANDD, have seen a huge rise in clients looking to tame their legacy data as new legislation requires companies to hand over or remove data files on request, forcing businesses around the world to reconsider their data management. Whilst the prospect of ploughing through your legacy data may bring you out in a cold sweat, there are easier, more efficient and cost-effective solutions than barricading a team in a room for weeks on end. Data discovery packages can help you to explore legacy data and classify it accordingly, so that it too can be managed and protected through your company’s data protection policies. Effective Data Classification solutions will show you more about your data’s movement than you’ve ever seen before. You can see who is using it, and when and how they are accessing it. Some solutions even give you the opportunity to model the impact of permissions changes, so you can ensure that your data protection measures aren’t impacting the daily running of your business.